Last year, we hosted a photo shoot for Make magazine: Kindy, reading in front of our brick-red dining room wall. 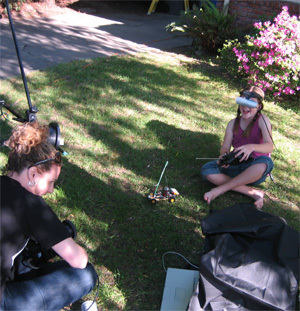 This year, the Make photographers came again, this time to shoot us for the images around a how-to feature (due out this summer) on how to build a robotic baja buggy that you can control through a remote control and VR goggles that receive images from a tiny on-board camera. Don't know which was odder: the fact that I should be a model for any kind of magazine shoot, or that I could pretend to have actually built such a thing.